TATRA supports motor racing and competitions on a long-term basis. 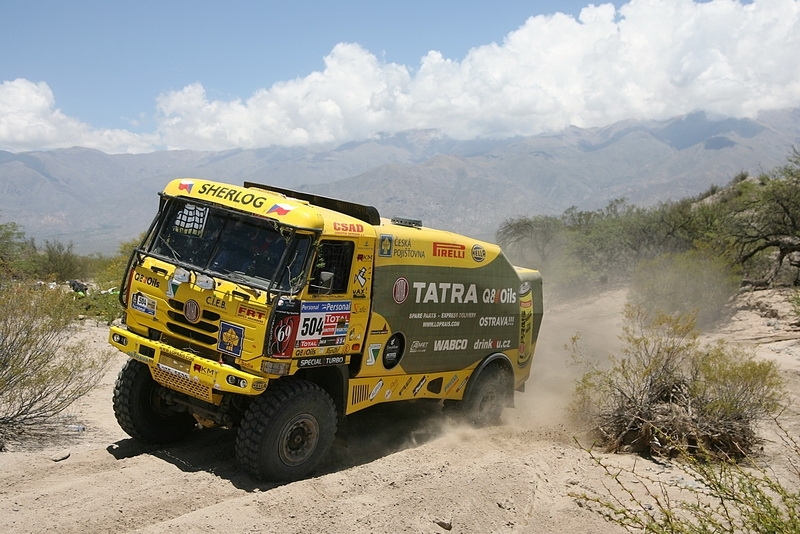 TATRA has participated in the Dakar Rally for more than 25 years. 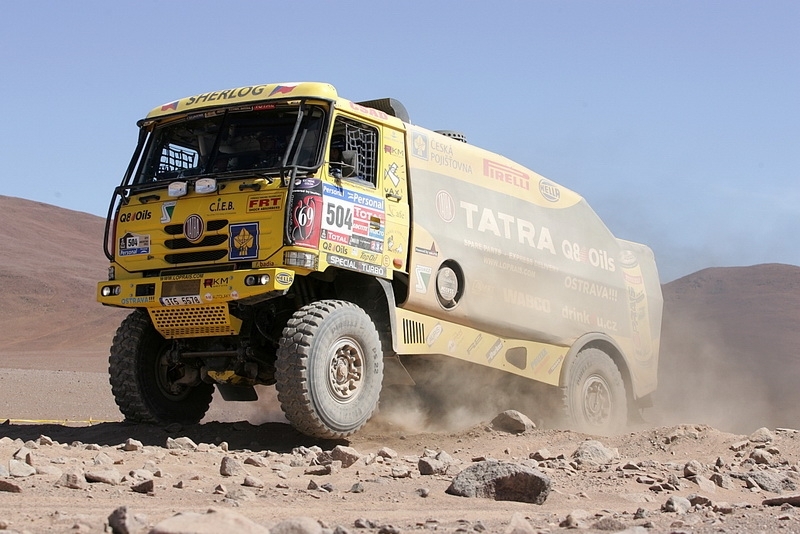 TATRA vehicles have won the Dakar Rally six times. 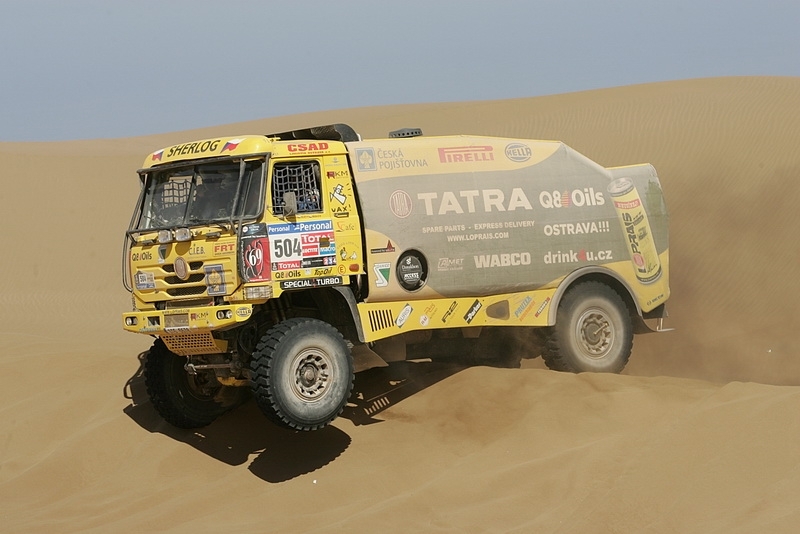 TATRA has placed among the top three at the Dakar Rally 18 times. TATRA supports four private teams. TATRA applies its experience and new technical improvements into mass production. The old truth that the viability of design solutions and their lifetime is best proven through competitions and races has always been of great importance to TATRA vehicle designers. Whether passenger cars or trucks, TATRA vehicles have always appeared on race tracks and in competitions. 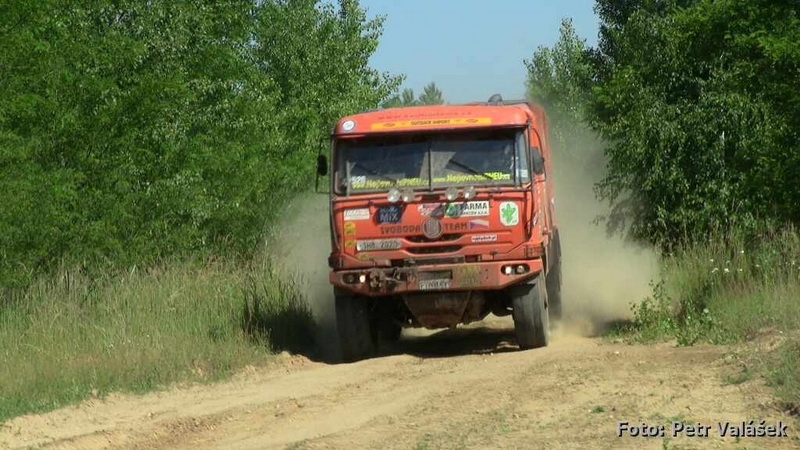 The best evidence for this is the continuing participation of special race versions of heavy TATRA 815 trucks in the most prestigious competition in the world with a name that says it all, the “Dakar”. Unlike the recent past when the factory sent its own team to international competitions (until 2001), it currently provides significant material, financial and operational support to four teams: the Loprais TATRA Team, the Letka Racing Team, the Czech Dakar Team and the Svoboda Team. These private teams benefit from the design and material capacity of TATRA, a.s. according to agreed conditions. 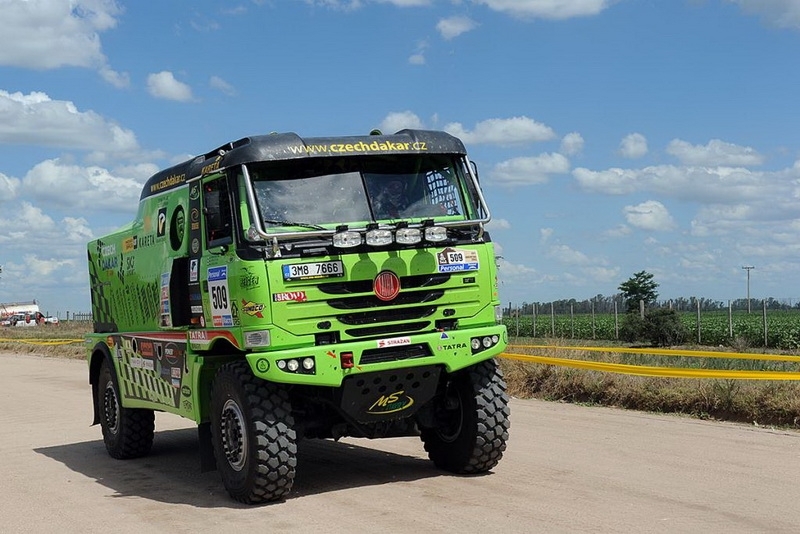 While the Loprais TATRA Team has developed its race vehicle on the basis of the TATRA 815 completely independently, the other two teams take full advantage of the design potential of the TATRA TRUCKS a.s., Technical Development Department. Building a good name is not primarily about sales; it is a long-term effort which needs investment. Moreover, the so-called “test in combat”, which real competition in the most difficult terrain surely is, brings great possibilities for the Development Department and the design of the vehicles themselves. In particular, numerous improvements that increase the value of the mass-produced vehicles can be actively and comprehensibly tested precisely here. So what have the TATRA racing trucks brought to mass production? One important and very visible design change or innovation is the two-axle all-wheel drive concept of an off-road truck. 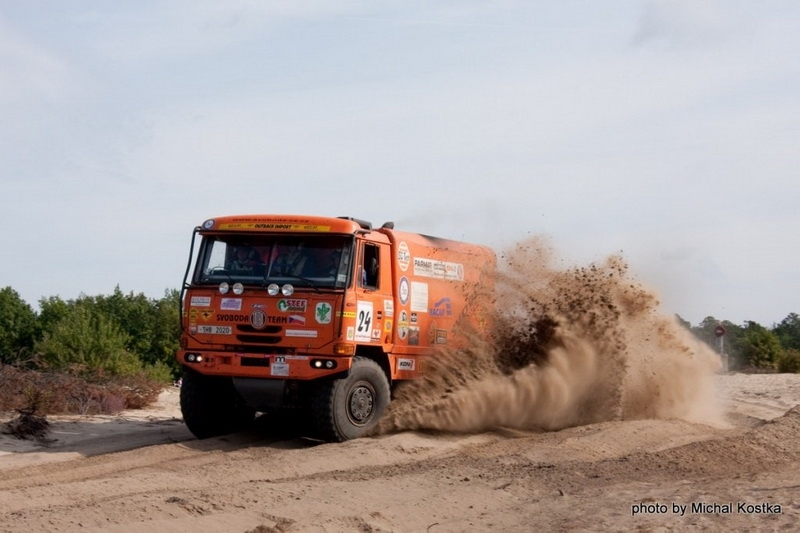 Four-wheeled trucks were introduced in Dakar 1987, the second year in which the TATRA brand participated. It is not uninteresting to note that the vehicles were prepared and produced under the direct responsibility of the Technical Development Department. Until that time TATRA had only produced two-axle platform trucks and construction trucks within the T 137/T 138 type range and later, as road towing vehicles (T 813 4×4, T 815). The new all-wheel drive four-wheeled trucks are now highly appreciated by army customers and municipal services, and we can find them in the construction sector as well. Other considerable changes coming from truck competitions can be seen particularly in the chassis, drivetrain and engine. Since the beginning of participation in competitions, the maximum power output of the mass-produced vehicles has gradually increased from 265 kW to 325 kW, while maximum torque has risen from 1260 to 2100 N.m. All this was achieved while complying with the contemporarily valid emissions limits Euro 1 up to Euro 5. The air-cooled engines with the Euro 3 emissions specification were unique because they had a mechanical injection pump. And what about Euro 4 and Euro 5 engines which are equipped with SCR technology, treating exhaust gases with the AdBlue additive? The only electronics used in them is in the injection system for the urea solution behind the collecting exhaust pipeline! They are still directly air-cooled and mechanical. Thanks to the competition versions, pressure air coolers and pistons with a cooling cavity and oil spray have appeared in the engines. To improve driving characteristics, air suspension for exclusively terrain conditions has been developed. An additional shock absorber has been added to the front and rear axle after experience from competitions. This design has proven itself most practical with vehicles intended for extreme conditions in Siberia. Thanks to the design change, the main shock absorber lifetime has increased between 4 and 5 times and the crew cab lifetime doubled. Cab anchoring brackets have also undergone significant changes after they broke as if they were made of paper in one of the first years of the competition. Similar problems have been prevented in vehicles for customers in Asian territories by reinforcing the brackets. The reinforced cab frame was successfully verified for the first time on competition vehicles and since then has been used for mass-produced trucks without any problems. The King Frame combined suspension system (leaf or coil springs used together with air bellows) was also tested on competition vehicles, both on the rear and the front axles. For some time now the King Frame combined suspension system has been a great benefit for good truck manoeuvrability in terrain and on the road while assuring minimum tyre wear. We should also point out the fact that the King Frame combined suspension system is a top–class innovation. In practice, it is in the same league as the whole TATRA vehicle concept and the directly air-cooled engine. Besides the TERRN01 and T 163 (JAMAL) civilian ranges, the T 815-7 special range with military and civilian versions has used it to great profit. To drive in sandy terrains, the re-inflation and under-inflation tyre system that can be operated when under way and the automatic minimum pressure monitoring have been developed. The modified system was successfully used in the construction of the customised mass-produced T 816-6ZVV86 28.400 8×8.1R/30 LIWA vehicle (1996 – 1998, 1127 vehicles for the UAE Army), later identified as T 815-6 for homologation reasons, and the whole special FORCE range. Special competition vehicles also used liquid-cooled engines from other producers and TATRA’s own new fourteen-gear transmission unit. Incidentally, LIWA, one of the most successful special projects, is equipped with a KHD Deutz BF 8MC 1015 liquid-cooled engine (400 kW/2650 N.m). Karel Loprais driving a TATRA won the Paris-Dakar Rallye in 1998, 1999 and 2001 with a differently adjusted version of this engine (evidence of how success in mass-produced vehicles influences the competition trucks) used for the first time in the T 815 2 ZE R55 4×4.1 Puma special competition truck (and since then in all other Loprais competition vehicles). It has become an unmistakable phenomenon at long-distance competitions. As a result, the TERRN01 range has been offered with the option of a liquid-cooled engine from a different international brand since 1999. The competition vehicles were directly owned by the manufacturer for a long time. Nowadays, when they are operated by private teams, their development and preparation is carried out in close cooperation with the development workshop or directly in the TATRA factory. 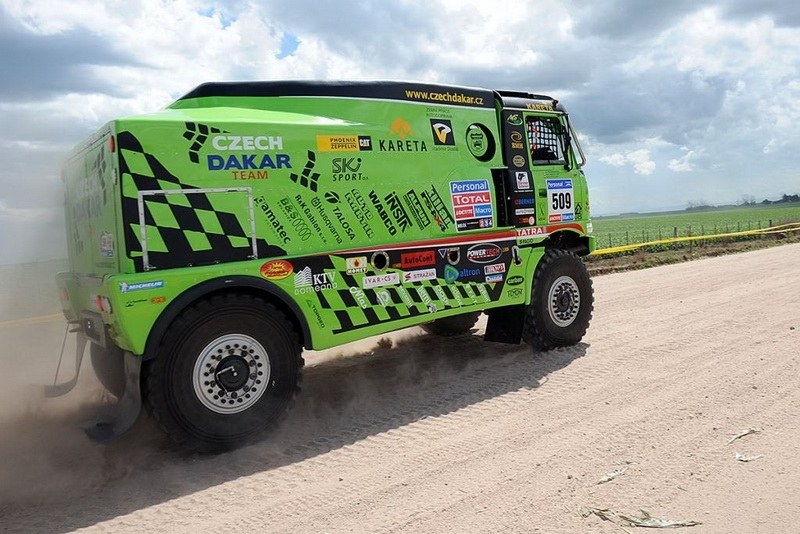 The most significant and perhaps cult-like connection arising from the competitive activities of our vehicle company is the phrase “TATRA-Dakar-Loprais”. 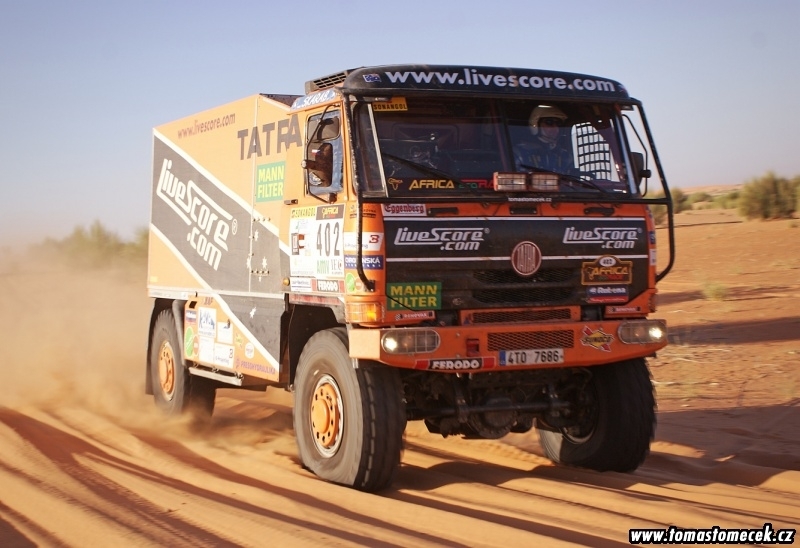 Although the fame of TATRA has also been spread in Euro-African competitions by Ing. Tomáš Tomeček (a pure TATRA with an original directly air-cooled twelve-cylinder engine), André de Azevedo (similar truck construction to Tomeček) and Marek Spáčil (2009 TATRA trucks with Deutz engines, 2010 TATRA trucks with Caterpillar engines), there is no TATRA fan who would not know the most successful Czech truck racer – Karel Loprais. His six victories in the most difficult rally in the world demonstrate the correct design choices of TATRA and are a clear-cut benefit for mass production. 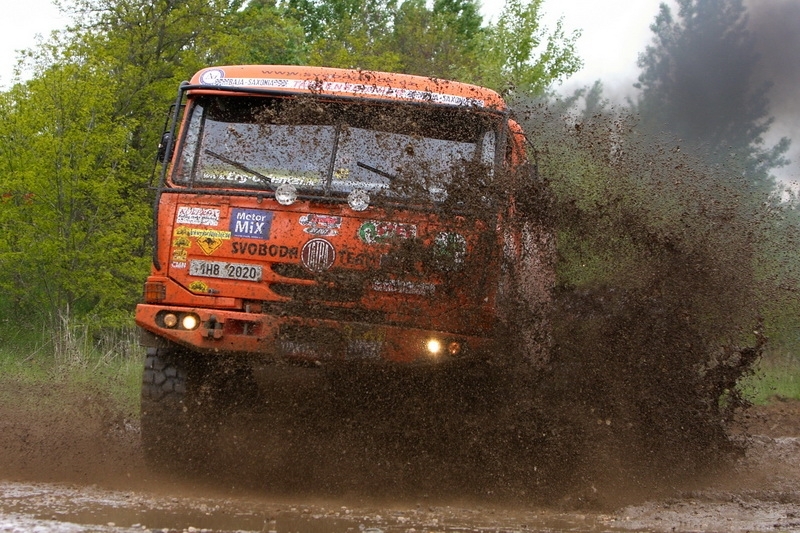 Although the trends in long-distance truck competitions are not very favourable in general and the TATRA vehicle concept (a central load-carrying tube and independently suspended swinging half-axles) is more suitable for extreme terrain than high-speed sprint sections, it should be understood that of all the premier league special vehicles on the starting line, the TATRA vehicles are probably closest to their mass-produced versions. Unlike the recent past when the factory sent its own team to international competitions (until 2001), it currently provides significant material, financial and operational support to four teams: the Loprais TATRA Team, the Letka Racing Team, the Czech Dakar Team and the Svoboda Team. These private teams benefit from the design and material capacity of TATRA, a.s. according to agreed conditions. While the Loprais TATRA Team has developed its race vehicle on the basis of the TATRA 815 completely independently, the other two teams take full advantage of the design potential of the TATRA, a. s. Technical Development Department. Special competition vehicles also used liquid-cooled engines from other producers and TATRA’s own new fourteen-gear transmission unit. Incidentally, LIWA, one of the most successful special projects, is equipped with a KHD Deutz BF 8MC 1015 liquid-cooled engine (400 kW/2650 N.m). 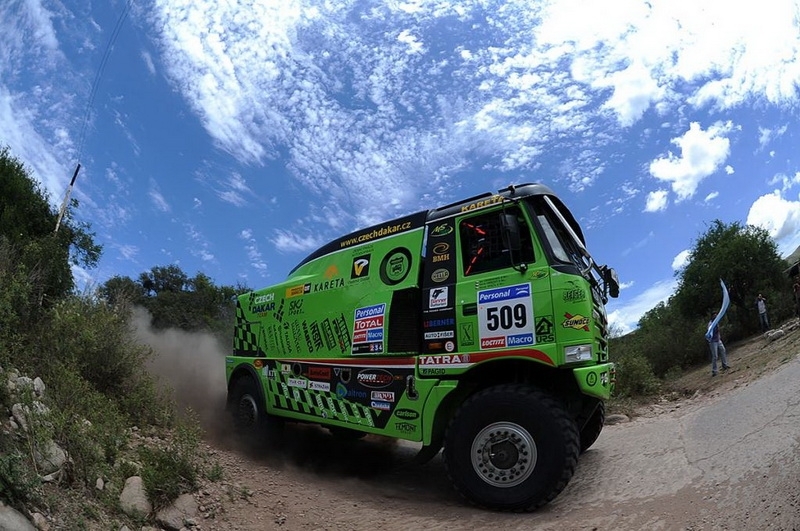 Karel Loprais won the fourth, fifth and sixth victories in Dakar in 1998, 1999 and 2001 with a differently adjusted version of this engine (evidence of how success in mass-produced vehicles influences the competition trucks) used for the first time in the T 815 2 ZE R55 4×4.1 Puma special competition truck (and since then in all other Loprais competition vehicles). It has become an unmistakable phenomenon at long-distance competitions. As a result, the TERRN01 range has been offered with the option of a liquid-cooled engine from a different international brand since 1999.